Chiropractic care is most commonly used to treat back and neck injuries and associated pain, but did you know it can be used to treats a multitude of other conditions? Being under the care of a licensed chiropractic doctor can help a wide variety of conditions, everything from allergies, headaches/migraines, and asthma to carpal tunnel syndrome, TMJ, sciatica, and fibromyalgia. Sports Injuries: Whether you’re a top athlete or just like to play an occasional pick-up game of basketball or take a bike ride with the family on the weekends, there’s always a possibility you could injure yourself. And the injuries could happen anywhere on the body and encompass those outlined below. Neck and Back Pain: This includes neck and spinal problems such as spasms, bulging, protruding, herniated or ruptured discs, poor/slumping posture, spinal stenosis, whiplash, pinched nerves, poor workplace ergonomics, stiffness and misalignment of vertebrae in the neck and spine, and scoliosis. Sciatica: This is hip and leg pain caused by an inflammation of the sciatic nerve from a bulging disc or a spasm, for instance. The pain can radiate up into the lower back and down the buttock and thigh into the calf and foot and cause numbness and weakness in the lower back and leg. Shoulder, Arm and Hand Pain: This includes rotator cuff tendonitis, golfers’ and tennis elbows, arthritis, bursitis, neuralgia, neuritis, radiculitis and circulatory changes, all of which can cause muscle weakness, paralysis (partial or complete), lack of coordination, and tremors. This also includes carpal tunnel syndrome, which is usually associated with numbness, tingling or burning in the hand, as well as grip weakness. It’s generally caused by pressure on the nerve that runs through the wrist to the fingers due to repetitive hand movements that cause inflamed tendons, misaligned wrist joints and fluid retention in the wrist. Joint Pain, Arthritis and Osteoarthritis: Arthritis happens because the cartilage between joints wears. Key areas affected include knees, hips, back, neck, hands, and wrist. 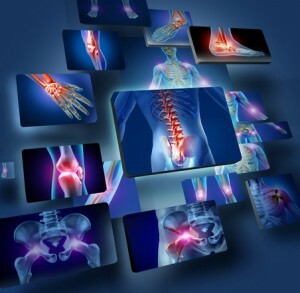 Osteoarthritis is the most common form of arthritis, and the most commonly treated by chiropractors. Joint pain and dysfunction not only can be caused by arthritis, but it can also happen when joints become stiff and full movement is restricted due to an injury, poor posture, overuse/underuse of a joint and muscle imbalance. A common form of joint dysfunction is sacroiliac joint dysfunction at the base of the spine where it meets the pelvis. This creates lower back pain and limits movement. It’s often misdiagnosed because symptoms are akin to sciatica or a herniated disc. Hip and Leg Pain: This includes sciatica, as well as other injuries and conditions such as shin splints and knee, ankle and foot pain due to musculoskeletal tears and strains and sports-related injuries. It also includes leg pain, weakness, numbness, and tingling. Fibromyalgia: Though there’s no specific cause, this condition could be triggered by a variety of factors which results in chronic pain throughout the body, mainly located in joints. TMJ: The temporomandibular joint (TMJ) is where the jaw bone connects to the skull, and when it’s misaligned or malfunctioning due to external trauma such as a car accident or the grinding of teeth, it negatively affects the ligaments, cartilage, fascia, muscles, nerves and blood vessels that run through and around it. TMJ dysfunction causes the inability to open the mouth wide, clicking or popping in the jaw, headaches, tinnitus (ringing in the ears) and shoulder, cheek, jaw and neck pain. If you’re experiencing back pain, neck pain, headaches or other chronic pain and wondering if chiropractic care is a good treatment course for your pain management needs, then give Dr. Todd Goldman at Total Chiropractic Care & Wellness in Medford a call at (631) 447-2299 today. He can help you naturally with pain management through chiropractic care and is qualified not only to treat musculoskeletal injuries, including auto accident, personal, workplace and sports injuries but also chronic pain conditions, including sciatica, carpal tunnel syndrome, neck and back pain, headaches and migraines. Dr. Goldman follows evidence-based treatment procedures that begin with diagnostic exams to precisely determine the cause of your pain. The adjustments he provides are based on his diagnostic findings and address the underlying musculoskeletal misalignments triggering a patient’s pain, rather than simply “masking” these symptoms with medication.